Container gardens are great for decks, porches, patios, or anywhere that you need a touch of color. Mark Van Buren, owner of Zehr’s on the Lake. offers four tips for keeping your containers looking beautiful all season long. 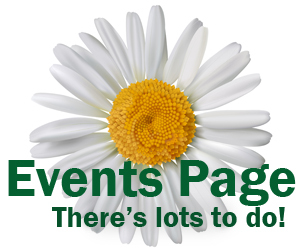 Buy a large hanging basket and a large container. Instead of filling the container with soil, just invert a small pot and set it in the large container, as we did in the first photo. Set your hanging plant on top of the inverted pot. Take off the hanger. Presto! 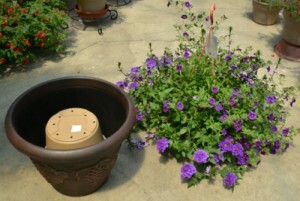 You have an instant container garden like the one in the photo at right. 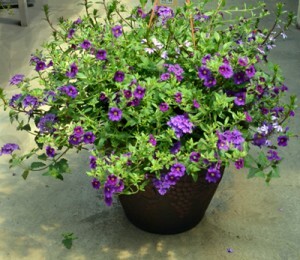 This container includes scaveola, calibrachoa and verbena. The hanging basket has already been growing for two months, Van Buren pointed out, so it’s full and lush. When you plant a container garden yourself, you have to be patient and wait for the flowers to fill in. The pop-and-drop method is also convenient if you need to move the container garden from spot to spot. Without all that extra soil, the container is much easier to lift and carry. You want to use a good potting soil, he said. It should have bark, aggregate and some peat in it. Don’t use too much peat, though. The peat will draw the water in, but when it’s dry, it almost repels the water. You want a potting soil that both absorbs and releases the water. 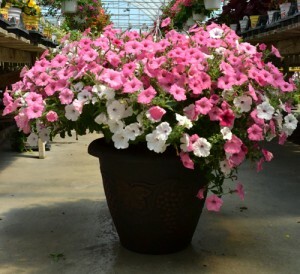 Another “Hollywood pop and drop,” this time with pink and white petunias. Van Buren picked up a handful of the mix he uses. “You can feel the coconut and bark in it,” he said. 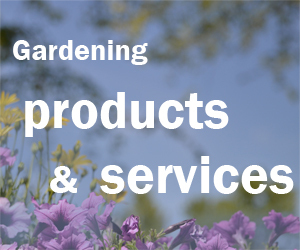 If you’re not sure what to buy, ask the staff at the garden center what they use and buy that, he recommended. When people create their own container gardens, they usually forget to add fertilizer to the soil. Van Buren suggests adding a little Osmocote, which is a general-use fertilizer for northern climates. Every time you water or it rains, the fertilizer will be released. Adding it once should be enough to last for eight to nine months. You should use a dash or a heavy tablespoon per container. 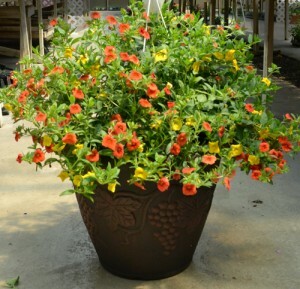 This version of the “Hollywood pop and drop” features yellow and orange calibrachoa. Then buy a saucer for your container and water from the bottom up. If the person caring for your plants sees that the container is full, he or she knows not to water that day. If the saucer is empty, all the person has to do is fill the saucer. I like the ‘pop amd drop’ concept as well as the other tips. Another tip that I recently learned to do is to add mulch to the pot surface. It keeps the p0otting mix from packing down over time and light potting mix from dying out too quickly in the summer heat. I know what you mean. I will never run out of things to write about! Thanks for that tip. It’s all about keeping the water in the soil during the summer, isn’t it? I use pop & drop for splashes of color in perennial beds – then move them around to draw emphasis to specific foliage after blooms drop! Fun and easy! Ooh, what a great idea! I think I will try that! I checked with Mark Van Buren of Zehr’s on the Lake and he said it should still be good.